CONSIGNED TO 2016 HORN SHOWCASE - OCV - She is one of the most elegant and feminine Jamakizm daughters out there today. Her dam is a clone of Doherty 6. Her half-sister by Top Caliber was one of the top animals at the 2015 Red McCombs Sales. In the middle of June she measured in at 78.5 with a several inches of growth over the last 5 months. She comes to you exposed to JBR Eclipse (Cowboy Tuff Chex x Eternal Diamond) he has 3 over 90" TTT animals in his pedigree. Millennium Futurity Eligible. CONSIGNED TO 2016 HUDSON-VALENTINE SALE. One of the largest framed Farlap daughters we have ever seen. She has produced several daughters that have sold from $7,500-$20,000 plus. BL Farlap Legend measured 82 ¼” TTT and 96 ½” TH on 10/27/15. Her dam is the over 80" TTT Tri-W Legends A-Do cow. Consistency becomes more predictable when you stack the pedigrees hard. She comes to you exposed to CV Cowboy Casanova. Feel confident when buying Bentwood cattle. Quality stamp of approval. Millennium Futurity eligible. THANKS TO CHRIS CLARK FOR THE PURCHASE OF THIS AWESOME FOUNDATION COW. CONSIGNED TO 2016 HUDSON-VALENTINE SALE. We have retained two knockout daughters out of this huge framed cow that is loaded with twist. Pedigree reads old school, but don't let that fool you. If you do your homework you will find several animals similarly bred that are huge horned with the total package. We have been working to bring Overlyn into our herd and now it is time to share this amazing cow with you. Comes to you exposed to CV Cowboy Casanova. Millennium Futurity eligible. THANKS TO BILL AND ELIZABETH HUDSON FOR THEIR PURCHASE OF THIS GREAT FOUNDATION COW. CONSIGNED TO 2016 HORN SHOWCASE. 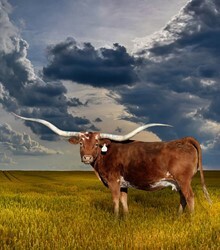 OCV - We are thrilled with the contribution that Doherty 6 made to the longhorns industry. M Arrow P. Dorthy is a clone of the $100,000 Phenomenal Dorthy cow. We are retaining two of P. Dorthy's sons to use in our program to further utilize her outstanding genetics. She comes to you bred to CV Cowboy Casanova for a fall calf. Millennium Futurity Eligible. CONSIGNED TO 2016 HUDSON VALENTINE SALE - OCV Large framed heifer that has TCC Rio Cane as the sire. He measured 79.75" TTT at 5 years. Her dam is a huge bodied cow that measures 78.25. Her pedigree is deeper than a coal mine in the Kentucky hills. You have one of the all time high selling cows in the breed as her grand dam SDR Candy Cane. This brings in JP Rio Grande, Awesome Viagra, and Hatch's Candy Cane. Hatches Candy Cane had just three offspring going through the Legacy Sale for over $300,000 generated. On the dam side you will find Boomerang CP, Wittrock 412 (Half-sister to Night Safari), Emperor, Delta Sandy, and Delta Trudy two of the best out of the Hoffman Program. She is ready to breed to the bull of your choice. Millennium Futurity Eligible. CONSIGNED TO 2016 HUDSON-VALENTINE SALE. This heifer has been a standout since she was born. Her dam is closing in on mid-eighties TTT, while tipping the scales as one of the largest bodies we have ever owned. Her sire is the largest TTT and TH bull the breed has ever seen. Loaded up with potential for horn contest, futurities, or one amazing brood cow. Millennium Futurity eligible. THANKS TO CHRIS CLARK FOR YOUR PURCHASE OF OUR OUTSTANDING HEIFER. THANKS TO TOM BILLINGSLEY FOR HIS PURCHASE OF THIS AWESOME HEIFER. CONSIGNED TO 2016 HORN SHOWCASE - OCV - We just love how this heifer is developing. Sire and dam are both over 80" TTT. We all know Casanova is knocking it out of the park on a regular bases. PCC Horizon is the dam of PCC Rim Rock. Cowboy Horizon should be mid to upper 50's at 24 months. 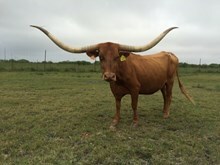 We have her exposed to RJF Bowtex (Archer Texa 290 X WS Rainbow) visit www.bentwoodranch.com for more information. Millennium Futurity Eligible. CONSIGNED TO 2016 HILL COUNTRY HERITAGE FALL SALE - OCV RJF Rainbow's End is a gorgeous well balanced heifer with a Who's Who pedigree. Her dam has sold for huge money on multiple occasions. Her sire is over 80" TTT son of JP Rio Grande and the over 90" TTT Shadow Jubilee. Her horns are coming forward but should roll back into a wonderful twist with age. The icing on the cake is we have Rainbow's End exposed to JBR Eclipse (Cowboy Tuff Chex X Eternal Diamond) The resulting calf will have 4 over 90" TTT animals in its pedigree. Raise your hand. Millennium Futurity Eligible.